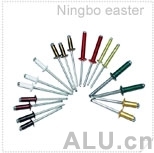 Ningbo Chaoxin Rivet Manufacture Co., Ltd. grew out of Ningbo East Sanxin Rivet Manufacture Co., Ltd., founded in 1988, is a professional joint-venture manufacturer of rivets. Currently, they can produce all kinds of self-plugging rivets in more than 300 specifications with the annual capacity of over six billion pieces of rivets. Our company has advanced production and testing equipments. We serve the clients both at home and abroad with modern scientific management and excellent credit. 90% of our products are exported. Relying on the tenet of “Quality fundermental, users upmost”， we are willing to cooperate with domestic and foreign clients. Welcome to visit.